Here's a useful comparative study from Donna Huryn, Carlo Ballatore and others at Penn which looks at a problem encountered by almost every medicinal chemist in their careers: finding the right isosteres for certain functional groups. I certainly have faced this challenge in my work, and this work illustrates that the solutions for addressing the challenge can be more subtle than we think. For non-medicinal chemists, an isostere is a set of atoms that can be swapped with another set of atoms in a molecule because it possesses physicochemical properties that are similar to the parent. This swap can be done for a variety of reasons: most commonly to improve physical properties like cell permeability. Carboxylic acids pose special problems for permeability due to their charge (since the cell membrane is hydrophobic and the charge renders them hydrophilic), so finding uncharged or other suitable charged replacements for them has been a routine consideration in drug design. The current study looks at 35 different isosteric derivatives of phenylpropionic acids. It measures common properties like permeability (in PAMPA), logD, pKa and plasma protein binding (PPB) which can influence permeability. It also calculates the logD and pKa for comparison with the experimental values. What the authors find is that by and large there are several acid substitutes like sulfonamides, hydroxamic acids and oxadiazoles which are superior to the parent acid in terms of permeability, and by and large this trend seems to correlate well with their logD and pKa values. I say "by and large" above because there is one glaring exception which sticks out and which is perhaps not obvious: tetrazoles. Tetrazoles are very common replacements for acids; intuitively one would think that locking up the atoms in a ring and adding in a carbon would improve their ability to get past a membrane. But as the study finds, tetrazoles have permeabilities that are generally worse than those of the acids, sometimes by as much as 1.5 or 2 log units. And this is perhaps not too surprising if you think a bit more about their structure: While you may be locking up atoms in a ring, you are also adding two more polar atoms. In addition the tetrazole NH group is as ionizable as the COOH group of an acid. The paper says that these effects lead to a bigger desolvation penalty for the tetrazole, and that seems right; the tetrazole just seems to love water more, and a quantum mechanical study that studies the details of its solvation pattern relative to the acid might be interesting. Tetrazoles also seem to present more plasma protein binding. There are some other interesting subtleties noted in the paper that are worth remembering. 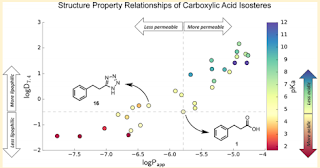 For instance the calculated logD and pKa values generally correlated well with the experimental values, except for two systems (oxadiazole-thiones and 1,3 dicarbonyls). They also noted that bigger desolvation penalties aren't always correlated with lower logD values. It's another slightly counterintuitive observation which I have seen myself in a kinase inhibitor study before. Overall these are nice lessons to remember. Medicinal chemistry is full of useful general rules, but exceptions such as these show that the field is far from explored and will always stay interesting; there will always be enough subtleties to keep us occupied. More generally this comparison illustrates one of my favorite principles in chemistry: similarity can be both useful and deceptive.